We’d love your help. Let us know what’s wrong with this preview of Mason Dixon & the Ghost Dinosaur by Eric R. Asher. The best-selling author of The Vesik series flexes his comedy muscles in a hilarious new comedy urban fantasy series! They are a bunch of highly armed rednecks, internet video celeb The best-selling author of The Vesik series flexes his comedy muscles in a hilarious new comedy urban fantasy series! Now Mason Dixon is back, and this time his problems are bigger than ever! The sasquatch is on his side, the zigmals are cute, and the gowrows are downright adorable, but when Mason Dixon and his sidekick Emma run afoul of not only a dinosaur, but also MoMo the Missouri Monster, he's in for the fight of his life! To ask other readers questions about Mason Dixon & the Ghost Dinosaur, please sign up. Wow, Eric Asher! I love this series! Totally into the characters, if your from the Midwest this is a real treat, Sasquatch, dinosaurs and all kinds of trouble. This in a throughly enjoyable book! Non stop action with same crazy twists! I love this Authors mind! Pick one up! You won’t regret it! 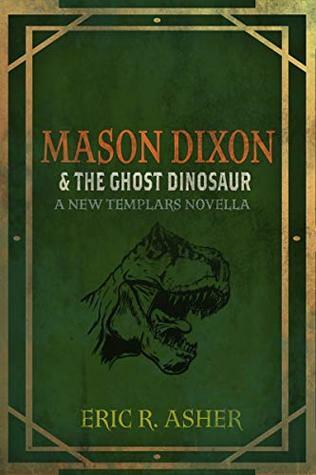 Mason Dixon & the Ghost Dinosaur is the third book in the Mason Dixon, Monster Hunter series. This can be read as a standalone. But they are so crazy you really should read them all! There is some violence...after all he is hunting monsters. I love this wanna be You Tube character and his pals. Definitely a fun read. This is another great tale of Mason Dixon and his encounters with legendary Missouri Cryptids! The author's research and knowledge of of these obscure creatures and folktales is quite impressive and his telling the tales in such a way as to help you believe that they are not 'monsters' but misunderstood critters from days gone by is truly an art! I highly recommend this book, series, and anything by the author! This is the third Mason Dixon book, and I started it not knowing that. You can read it without reading the previous books, but I was enjoying it so much I went back and read the others first, and they definitely enhanced my enjoyment - and they're so funny, it's no hardship at all reading them all! Anyway, this book is a combination of comedy, cryptids, magic and mad adventure... So fun! I highly recommend this book (and series!) if you like silliness and daft creatures, or are just looking for s This is the third Mason Dixon book, and I started it not knowing that. You can read it without reading the previous books, but I was enjoying it so much I went back and read the others first, and they definitely enhanced my enjoyment - and they're so funny, it's no hardship at all reading them all! Anyway, this book is a combination of comedy, cryptids, magic and mad adventure... So fun! I highly recommend this book (and series!) if you like silliness and daft creatures, or are just looking for something different to read. I loved it, and can't wait for the next instalment to come out!! Eric R. Asher has written another great Templars Novella! There's plenty of action right away to grab you and keep you reading to find out what is going to happen next. Mason and his camera person, Emma, face high adventures when they are trying to fake some adventure films and a large "ghost" dinosaur interrupts them. The Jimplicute makes your heart jump into your throat on several occasions as well as invokes other emotions further along in the book. Other Cryptids and some Magyck abound in th Eric R. Asher has written another great Templars Novella! There's plenty of action right away to grab you and keep you reading to find out what is going to happen next. Mason and his camera person, Emma, face high adventures when they are trying to fake some adventure films and a large "ghost" dinosaur interrupts them. The Jimplicute makes your heart jump into your throat on several occasions as well as invokes other emotions further along in the book. Other Cryptids and some Magyck abound in the Novella! Definitely a great read! This is the first Mason Dixon book I have read, so it was a little confusing at first but I caught on quickly. The setting was easy to visualize and the developing story really kept my attention. Very scary critters, Interesting characters and the interplay between them was fun. I look forward to reading more from this series. Eric Asher has another hit on his hands with the third book in this series. I have enjoyed the interaction between the characters since book one. The reader sees the overall story of the series develop more while being pulled into the action of the current book with the Ghost Dinosaur. You have action, humor and monsters with crazy names that unleashes your imagination. Another good adventure with cryptic by Eric Asher. I've come to look forward to each new book in this series and this book certainly lived up to expectations. Looking forward to the next one.